Anath Shalev, MD (right) and a researcher in Shalev’s lab. Rogue T- cells that attack the body’s own pancreatic beta cells have long been known as the primary villains in the autoimmune process that becomes Type 1 diabetes. Several years ago, a second culprit was discovered lurking behind the scenes. Its role in contributing to beta cell death and diminished function was unmasked in research led by Anath Shalev, MD, director of UAB’s Comprehensive Diabetes Center. 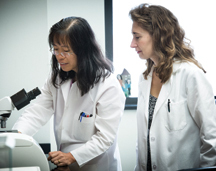 The center’s continuing research recently identified a second critical role TXNIP plays in diabetes when it found that high levels of the protein directly block insulin production through a new pathway. It induces a microRNA, miR-204, to down-regulate the MAFA transcription factor involved in promoting transcription of the insulin gene. This offers a second new target for therapies to counteract the progression of diabetes. The first target was reducing the overproduction of TXNIP itself. Shalev had noticed in an earlier study that a calcium channel blocker seemed to be effective in inhibiting TXNIP overproduction. In fact, the response was so dramatic that when mouse models with established diabetes and blood sugars above 300 milligrams per deciliter were treated with Verapamil, the disease was eradicated. The next thought is how well will human diabetics respond? Answering that question is the goal of a new clinical study funded by the JDRF that has just begun recruiting 52 subjects, and recruitment is expected to continue through the end of the year. To qualify, subjects must be between the ages of 19 and 45, and have been diagnosed with Type 1 diabetes within the past three months. Fernando Ovalle, MD, director of UAB’s Comprehensive Diabetes Clinic, and co-principal investigator, will oversee all clinical aspects of the trial. Patients will be using insulin pumps and 24-hour glucose monitoring. Shalev is optimistic, but cautions that with such different life spans, what can be achieved in a one-year study in humans compared to a one-year study in mice is hard to predict. The ability to inhibit over expression of the gene producing the TXNIP protein would also likely have benefits for patients who have Type 2 diabetes, since high glucose levels seem to be triggering similar effects and problems from the protein. Shalev also pointed out that two additional advantages to this approach is that reducing TXNIP doesn’t require any suppression of the immune system and Verapamil is a known drug already approved by the FDA. Its action is well understood and it is generally well tolerated. At dosages used to treat migraines, it has already been used in patients without hypertension with no significant impact on blood pressure.